You’ve probably seen those photos which look as if they are images of miniature landscapes. In general, they’re taken with special (hence, expensive) tilt-shift lenses. Normally when you take a photo, the plane of the lens is parallel to the plane of the CCD sensor in the camera (or film, if you’re that old). This means that the focused object (which we also assume to be in a plane parallel to the other two planes) is in focus across the whole sensor. The portions of the field of view that are closer to the camera, or further away, are less in focus, and the further away they are from the object plane the more they’re out of focus. Tilt-shift lenses play on that by tilting the lens with respect to the sensor. Instead of being parallel, they are now are an angle to each other. The characteristics of the focus changes and the depth of field increases (or decreases, depending on how you tilt). Shift on the other hand keeps the lens and sensor planes in parallel, but instead shifts the lens up/down/left/right. It helps correct the perspective errors seen in architectural photography. (In essence, you want to keep the camera parallel to the ground (horizontal), but in doing so you lose the top of the building. So you point the camera upwards, but now the verticals of the building converge. 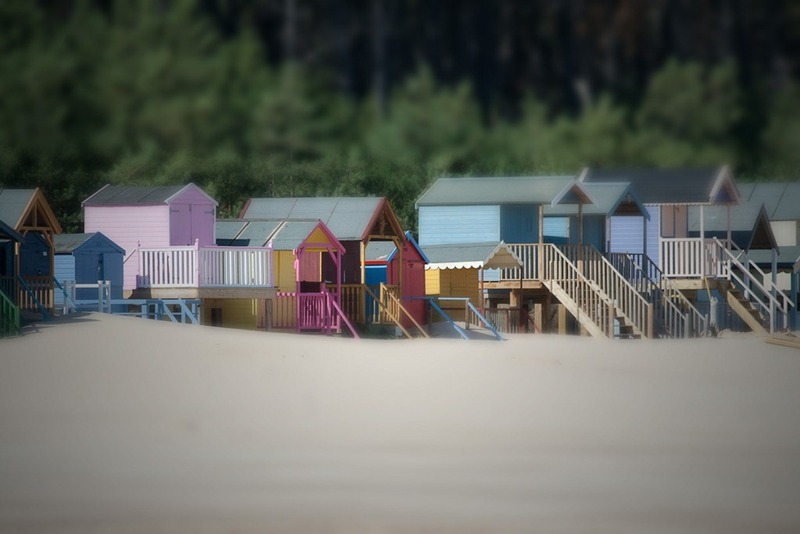 Tilt-shift lenses correct this convergence effect when the lens is shifted.) Wikipedia has more information. Both of these effects can be used “backwards” (yeah, I know, I know, a non-technical term) to make the depth of field extremely shallow. Foreground and background quickly fall out of focus. It gives the effect of photographing a miniature landscape. But, as I said, the lenses are very expensive (Canon’s wide angle tilt-shift lens is more than $2K, for example – you’ve really got to want to do this kind of photography). Lensbaby has a range of lenses and addons for different types of cameras (for example, the Composer at $250) that do tilt or shift. So, people cheat. They apply Gaussian blur above and below the point of interest in the photo to simulate the blurring of focus with distance. You can do this manually with a program like Adobe Photoshop, or you can buy specialist programs like Alien Skin Software’s Bokeh 2 add-in for Photoshop or Lightroom ($200), which has a complete range of creative bokeh effects. 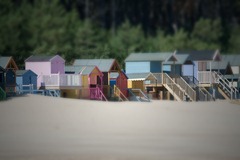 Or, you can cheat even more and download Art & Mobile’s TiltShift Generator. It requires Adobe Air, but it’s free, so you can play around with the effect to see if you like it without being out of pocket. If you really like the effects they sell the equivalent app for iPhone as well ($0.99). At a buck, it’s just worth it to try it out if you use the iPhone camera a lot. Since I have Air installed already for Tweetdeck, this was a no brainer. I warn you though: it does require images that are less than 1600 pixels along the long edge. 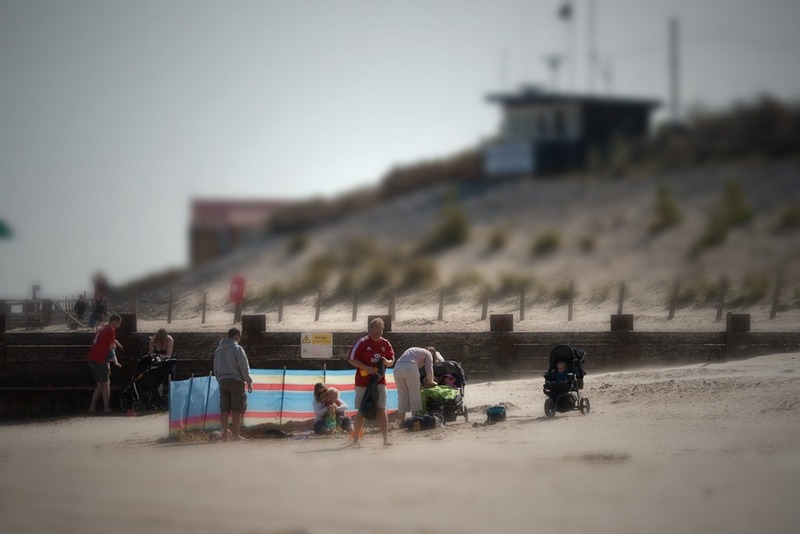 I used it to fiddle with some photos from our visit to Wells-next-the-Sea 18 months ago. 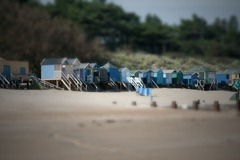 Not too bad given that it’s a fake tilt-shift. Try it yourself! Nice. On the iPhone, Instagram and Camera+ apps have this slick feature too. Mehul: You know, I'm going to have to get on the Instagram bandwagon: I keep seeing photos from and references to it. Yet again, you've prompted me to do something new :).